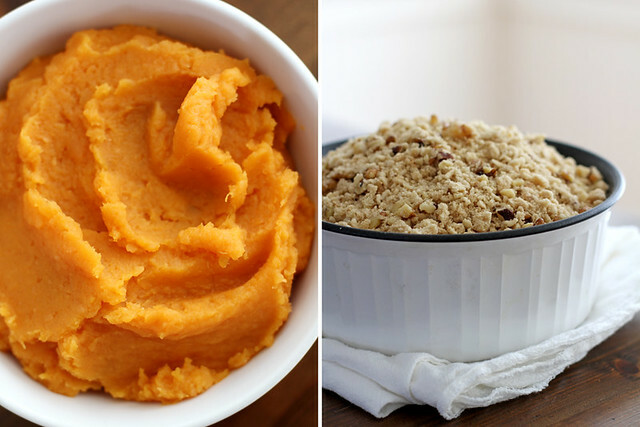 Right there, between the crunchy, nutty streusel topping and the smooth, buttery, warm sweet potatoes? Where I want to be alldayeveryday. Say hellloooo, dahling to another one of my family’s Thanksgiving side dishes that we just can’t get enough of every year. Unlike Mom’s baked bean casserole, this one wasn’t a part of our annual repertoire until a little later in my youth, and that’s because it’s based on a recipe from my dear aunt Lynn. We had Thanksgiving at her and my uncle’s house in Alabama once way back in the day (I think I was still in my scrunchies/crimped bangs/Lee Pipes/clogs phase) and, true story, she made this casserole and we all were done for, in a slump-over-our-chairs-in-bliss-from-all-the-yums kind of way. It was love at first bite, and we couldn’t go without it for subsequent Thanksgivings. It’s been on our holiday table every year since then — a beacon of bright-orange, buttery, sweet and streusel-y deliciousness, cuddled up right next to the rolls and the green beans. The crack is that moment when you take the serving spoon and dig into the casserole for the first time. The streusel topping has baked into a crunchy dome that seals in the deliciousness of the smooth sweet potatoes underneath, so when you press that spoon into the topping, it kind of cracks, releasing the sweet aroma of the casserole inside. I. Love. It. Like its pal the baked bean casserole, this casserole tastes even better the next day — this year, I’m thinking the leftovers need to be mixed with oatmeal and called breakfast. And it’s open to variation, too — you can use walnuts or pecans or a mixture of both on top for the streusel, and I alllllmost browned the butter that gets mixed in with the sweet potatoes because ZOMG (but I didn’t because I forgot, wah wahhh). And yes, yes you can add some mini marshmallows to the top if that’s your thing. But I’m telling you, even without all of these variations/additions, this casserole is outstanding. And we in our stretchy pants can all give my sweet aunt Lynn in the South a big thank you and virtual bear hug for it. In a large bowl, stir together mashed sweet potatoes, sugar, butter, milk, vanilla and eggs until well combined. Pour and spread evenly into a casserole dish. In a medium bowl using a pastry cutter or your fingers, combine pecans, brown sugar, flour and butter until mixture forms a coarse crumb. Sprinkle streusel evenly over top of casserole. Bake 40 minutes until casserole is baked through and streusel topping is golden brown and bubbling. Once I went streusel, I never went back. These taters look amazing–rich, creamy, and oh so yummy! Bring on the streusel! These look awesome! Lets hope the clogs never come back but this bake could sure come to my place any time! That topping is so temping! 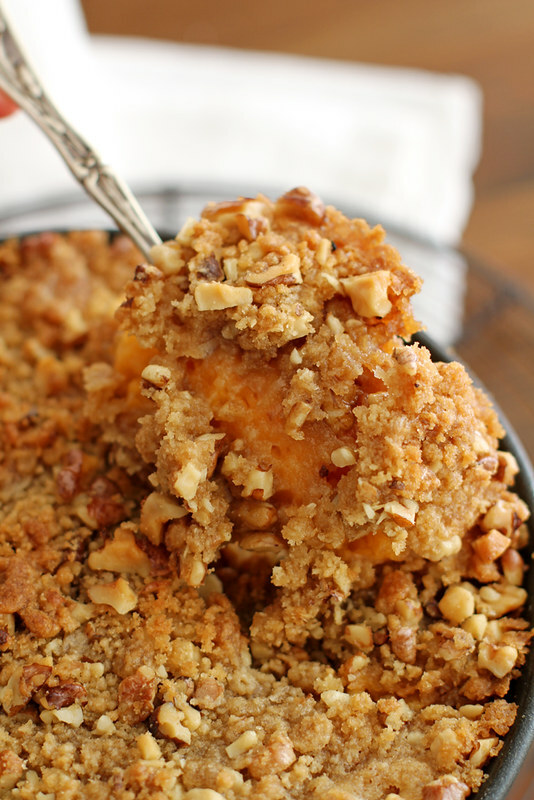 Now you know I love this!… Streusel topped sweet potatoes, Brilliant! 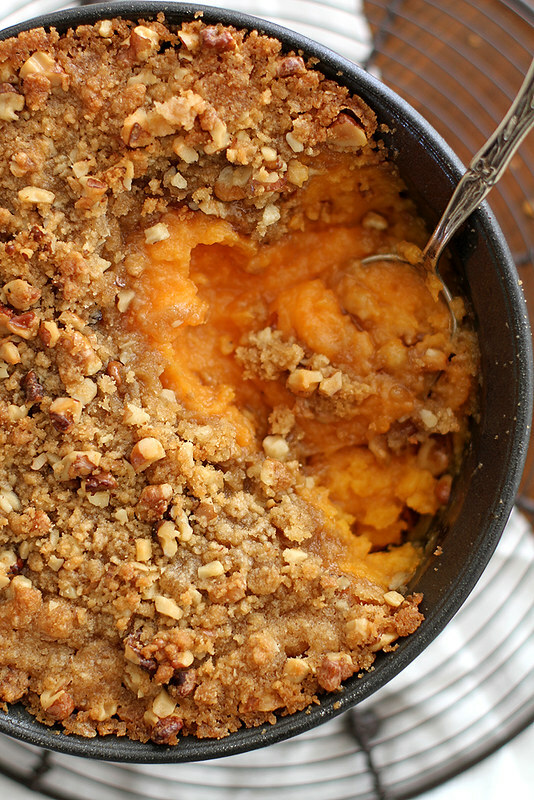 I usually not a sweet potato casserole girl, but that topping, SWOON! Pure, unadulterated heaven. This sounds absolutely perfect!! This is what I’m talking about! Looks amazing! Pinned. This looks absolutely delicious. Anything with streusel topping is my favorite! Do you think I could make this ahead of time and reheat it? We’re doing our own Thanksgiving which means my oven is very busy between turkey and rolls already. But this sounds so delicious! This is one of the times I wish I could squish a double oven in my little kitchen. Laura — Yep, that’s what we are doing! You can freeze it and then reheat it in the oven at 350 until it’s warmed through. Happy Thanksgiving! Soooo passing this along to my MIL. She was just talking about trying a sweet potato casserole like this for dinner this year! This was such a fun read Stephanie! As someone who reads about food all day I often get bored with food descriptions. (I’m sure you can relate??) But I am completely sold! And entertained. I need to try this, even though I’m usually not a fan of sweet potatoes. But STREUSEL!! Hello. Always a fav at my Thanksgiving table! You knocked it out of the park with these gorgeous photos Stephanie! That casserole looks amazing, I love that streusel topping, that sounds way better then marshmallows on top to me! The crunchy topping would be such a great contrast to the soft potatoes. Yum! Oh yeah, I could definitely do this all day, everyday. YUM times 5! I think I could eat cardboard if it was covered in streusel. Seriously. LOVE it. This sweet potato dish looks wonderful! Oh, I want it I want it! Your family knows how to get down on Thanksgiving. How do I invite myself over? This is totally my kind of side!! So yummy! 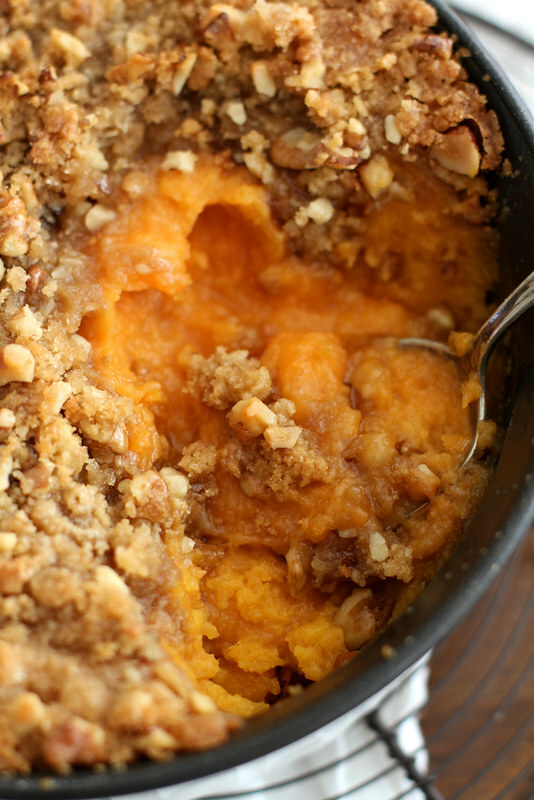 I love streusel topped sweet potatoes! By far my favorite part of Thanksgiving!! Streusel on sweet potatoes?? Why have I never had this before?! This is FOR REAL Thanksgiving done right. Although I’m considering making it and eating it for breakfast all this week. So I don’t have to share. Joanne — I 100% support that idea. Yum! 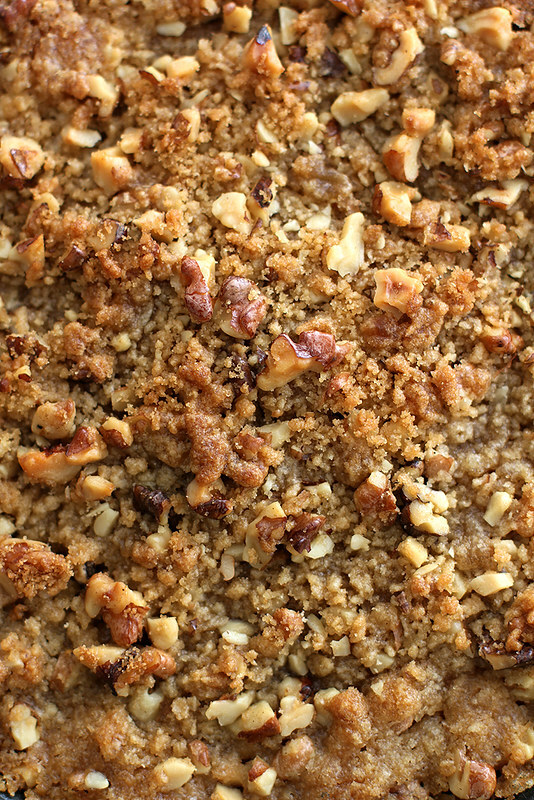 This streusel is way better than marshmallows! Hello – I’m just seeing this for the first time and would love to try it, but my boyfriend is not a fan of too much sweetness in his sweet potatoes – he’s a purist that way. Is this casserole very sweet? Can I cut the sugars? Mariann — I would say if you don’t like sweet casseroles, this recipe probably isn’t for you. You can certainly try to cut down the sugars, but it may alter the flavor of the casserole in a negative way. It’s not overpoweringly sweet, but it certainly is sweeter than just, say, regular sweet potatoes. Hope that helps! Leslie — I’m so sorry to hear the recipe didn’t work out for you! I’m a little confused about the square icon, because it reads fine on any computer I use — it’s 1/3 cup milk. I apologize for the mishap!